The nearly undroppable wax applicator. The demand for these P21S Foam Wax Applicators was so strong that P21S now offers them in a 2 pack. Originally packaged with the P21S 100% Carnauba Wax, these easy-grip wax applicators became a hit with users who wanted extra applicators for future use. The P21S Foam Wax Applicators are available in packs of two for easy wax and polish application. The P21S Foam Wax Applicators have an ergonomic design that is easy to grip without dropping. The finger cut-out on each side of the applicator gives you a secure hold. The dense gray foam gives the pad enough height to keep your hands (and fingernails) away from the paint. This gray foam is not absorbent – that keeps the wax in the yellow foam and away from your fingers. Waxy fingers drop applicators so P21S designed this applicator to be nearly undroppable. But if you do drop it, you have a backup applicator! Wash and reuse your applicators. Wash used applicators in DP Polishing Pad Rejuvenator and air dry. When not in use, keep your P21S Foam Wax Applicators in a resealable plastic bag to keep them clean. This is the same applicator included with P21S 100% Carnauba Wax. 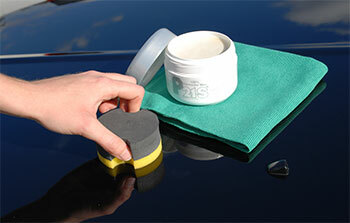 Use P21S Foam Wax Applicators to apply P21S waxes and Paintwork Cleansing Lotion. The soft yellow foam is nonabrasive and completely safe on all types of paint. The gray foam gives you a comfortable and clean place to grip the applicators. Great for tight spaces. Great for gripping and easy to clean. ConsOnly two to a pack. Should sale in bulk packs. I grew tired of using larger, non-ergonomic foam applicators, so I gave these a try. They are working great for me. They are comfortable to hold and easy not to drop. I no longer get hand cramps while applying wax. The grey portion is what touches the paint. The foam here is a little on the hard side, and it can squeak as it's (gently) rubbed onto the paint. However, I saw no indication that it was damaging the paint or too coarse. They are small though, so waxing takes a little bit longer that I would like. I recommend these. Found the small size to fit in pretty much any wax tub for easy access to getting wax on the foam. The soft yellow foam is stiff and yet soft so it won't scratch the paint. The stiff gray rubber part is great in your hands and won't fatigue your hand/arms!